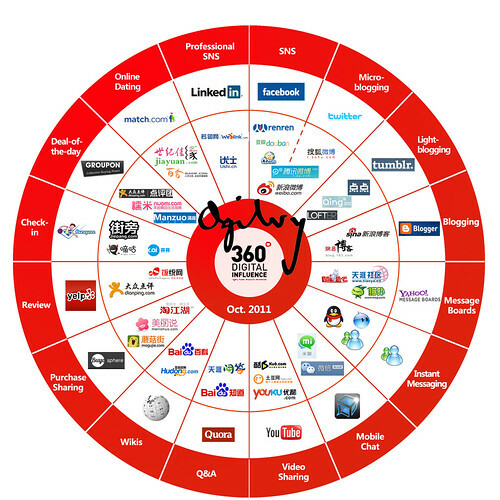 Ogilvy China updated its infographic showing China’s social media equivalents – or copycats, as Western media loves to call them. Of course many of these started out as copycats, but most evolved into much more than the original Western website, either by adding additional functionalities or by localization of functions. Interesting is that they now partially merged the SNS and microblogging categories. Services like Sina Weibo are so much more than Twitter is, that they come close to what Facebook offers the Western world. One of the categories that Ogilvy added was light blogging service Tumbler, for which they suggested China copycats DianDian and Qing. It’s an interesting category that I still don’t really get. Setting up and posting to a blog is so simple, why use Tumbler for that? Another new category is Purchase Sharing. I believe this might be a major one, especially in China where people love to show off everything they buy or want to buy. Western fashion diaries/blogs like lookbook.nu are a good example of this from the fashion industry, other sectors will probably follow. I don’t agree with all equivalents (where is Lashou in the Groupon copycat section? ), but it gives a nice overview of what’s happening on the Chinese Internet. It’s also a good way for Western companies to check out what their Chinese equivalents are up to, they may be able to learn a thing or two from them. Click on the picture for a bigger version of the social media infographic, or see the original here. It’s a nice handy overview, but hopefully doesn’t pretend to give an overview of the Chinese market. Thijs, I agree with you that some (big) services are missing. Not sure what their exact criteria are for this, I guess it’s more gut feeling than science that led to this overview. The original blog post (that I linked to) says that they welcome suggestions, so you may want to consider letting them know about what you feel should be included in the next edition. This is my infographic, so consider “us” told! Thanks for posting this, Marc, and thanks for your comments, Thijs. Although admittedly these is no science to it, we do put a lot of thought into it and get the opinions of as many people we possibly can. For the blog platform, we kept it to the biggest blog-only platforms. This is why we didn’t mention QZone. You are right about QQ though, which I had left out because I see it firstly as a desktop thing.